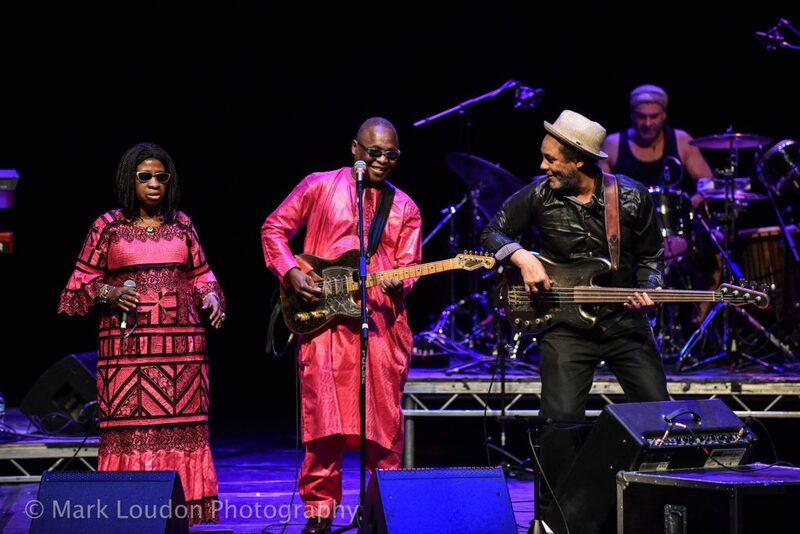 Husband and wife duo Amadou and Mariam brought their unique blend of pop, blues and Malian music to the Liverpool Philharmonic Hall on 3 December, as the curtain closer for DaDaFest International 2016. They were supported by local musicians including Young DaDa Ensemble’s ‘Evolve’ group, Anwar Ali & Dave Owen and Radio Exotica. Review by Joe Turnbull. 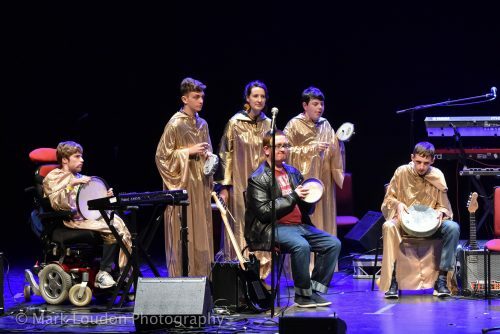 On the UN’s International Day of Disabled People, it seemed a very fitting full stop to end an expansive programme for this year’s DaDaFest, by bringing the international sensation of Amadou and Mariam and putting them on a stage with local Deaf and disabled musicians. Make that an exclamation mark. Or two. DaDaFest’s Ruth Gould explained at the start of proceedings how she’d been plotting for years to bring them over. It was certainly quite a coup. The responsibility of kicking off the festivities fell onto the young, but precociously capable hands of Young DaDa Ensemble’s ‘Evolve’ group. Having only had their first gig in July of this year, it was quite an ask to put them on such a large and prestigious stage, warming up for an Emmy-Award nominated force in the world music scene. But why aim low? 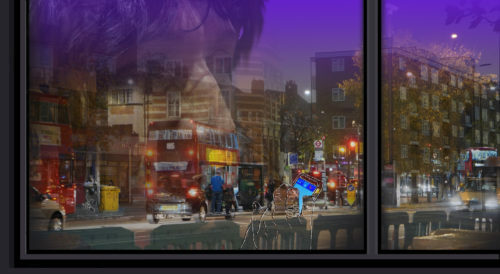 DaDaFest is an organisation that has built its reputation on taking risks. The exuberance of youth oozed from the golden-clad ensemble from first to last. Rolling, pounding rhythms of a drumming duet set the tone, followed by a bold beatboxing solo as a prelude to the ensemble getting into full swing. 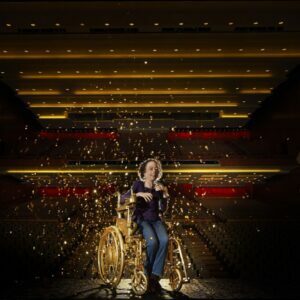 Before that could happen, they were waiting for the cue from a young keyboardist, who seemed to delight in teasing both the audience and fellow performers with some seconds of tension. 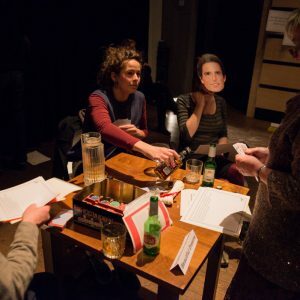 He was prompted by a facilitator to get going, and exclaimed: “I’ll get the show started when I feel like it,” or words to that effect. It was a delightful moment that you simply wouldn’t get in most concerts of this ilk. He was true to his word, and energy seemed to surge through the room once the ensemble were all in full flow. Some numbers felt more coherent than others and one in particular overused some questionable synth sounds, bordering on cheesy, but even though the ensemble lacked some polish they still most certainly sparkled. What I really longed for was a moment that unified all of the strong elements such as the rapping, beatboxing and pounding drumming along with the more melodic flourishes. There’s time for them to work on this, and as it was it gave individuals a chance to shine in solos. The stage switches and interludes were kept simmering nicely by the worldy sounds of DJ double act, Radio Exotica who provided the perfect backdrop to such an evening. 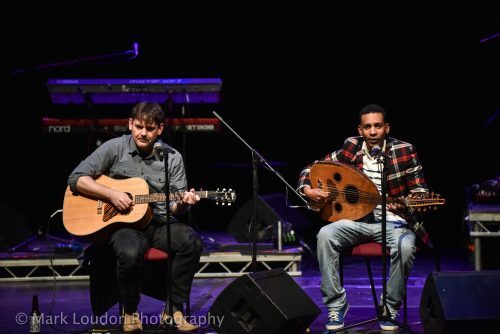 Anwar Ali & Dave Owen have been making music together in Liverpool for the last four years, having both originated elsewhere (Somalia and Oswaldtwistle, Lancashire, respectively). They delivered a poignant yet uplifting acoustic set, with Ali on the oud and Owen on the guitar. Several songs were traditional Swahili songs, with another a piece of Norwegian folk music. The pair kept things ticking over with up-tempo numbers, wrought with emotion. And then the main event. Amadou and Mariam strode onto the stage with a disarming nonchalance. Their supporting musicians kept things dialed up to 11 – at times annoyingly so – but the couple cut figures of relative serenity, assured in their musical talents. They were effortlessly electrifying. Amadou’s intricate yet frenetic blues-inflected guitar solos stole the show. These were contrasted with his more repetitive melodic loops that would surge in intensity, his guitar playing keeping everyone else together in the way often only a drummer can. Gould had introduced the set by encouraging everyone who could to get to their feet and dance to celebrate the occasion of the day. Slowly, as if gradually pulled out of their seats by the magnetism of Amadou and Mariam, people began to stand. The pair’s sound is an infectious cocktail of pop and blues, stirred with strong Malian spirit. It’s toe-tapping revelry without sounding clichéd. But pretty soon the toe-tapping became feet-stomping, then all out jumping and jiving. The whole auditorium was bouncing for the last half hour. The concert bordered on the euphoric as the set crescendoed to climax. What a way to celebrate this day of international significance, and cement the place of DaDaFest as a festival making global ripples. To find out more about Amadou and Mariam click on this link to their website.